As much as the kids keep trying to get me to approve of them wearing tank tops and shorts outside, the truth is, it’s getting cold out there! When it gets cold, that means it’s time for hot chocolate. I don’t mind the store bought hot cocoa, but really, it’s pretty weak compared to homemade hot cocoa mix. 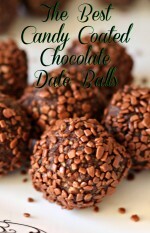 A mix that comes with a fantastic cocoa flavor and can be enhanced in anyway you want. All of that comes with a simple hot chocolate base and I’m sharing that with you right here, right now. This is all you need. Two cups of powdered sugar, one cup of cocoa powder, a half cup dry milk, and one teaspoon of salt. Then a mason jar to keep it all in. Pretty much all you do is combine all the ingredients in the mason jar and you’re good to go. I like to run the powdered ingredients through a blender to make it a more uniform mix. 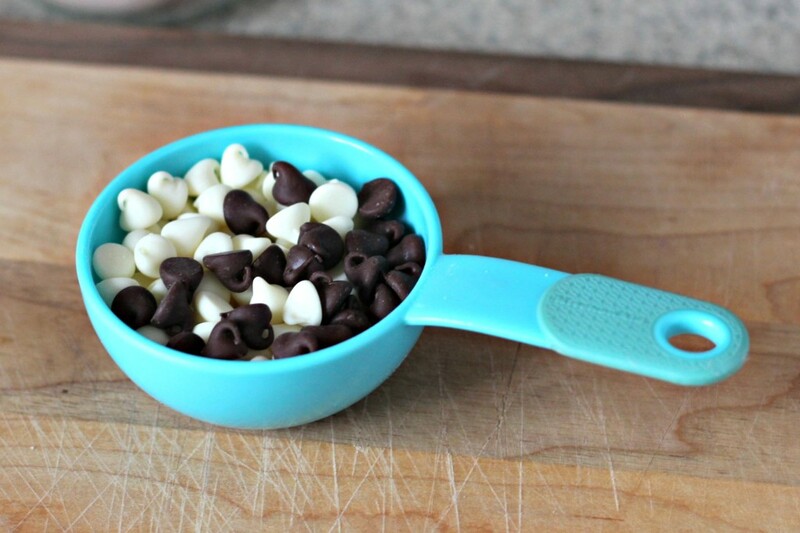 If you want, stir in about a half cup of chocolate chip bits. If you run them through a food processor you’ll have a better chance of them dissolving for an even chocolatier hot chocolate. Serve your hot chocolate with one cup of water, milk or add in some cream or half and half, your choice based on preference. Just stir in two or three tablespoons of the mix, and stir to perfection. 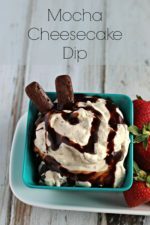 Top with whipped cream or marshmallows and enjoy! Mix all ingredients together and store in an airtight container. 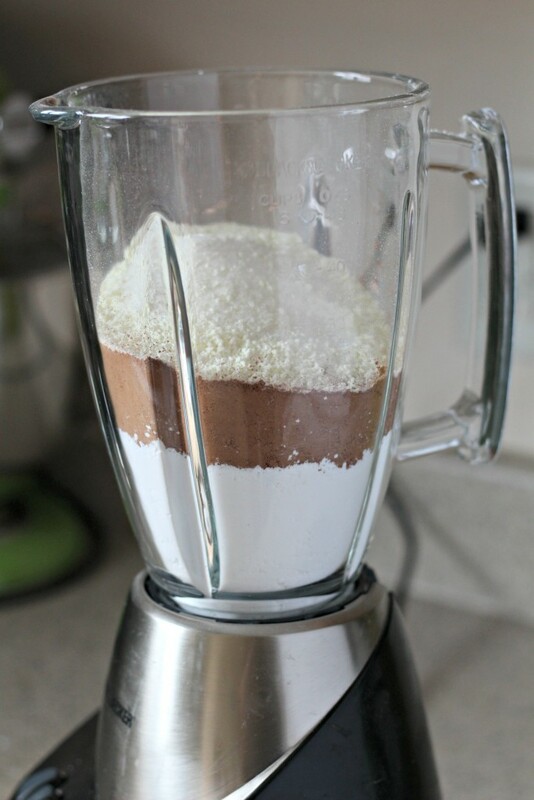 Run mix, minus the chocolate chips, through a blender to make it a finer powder to better mix all ingredients together. 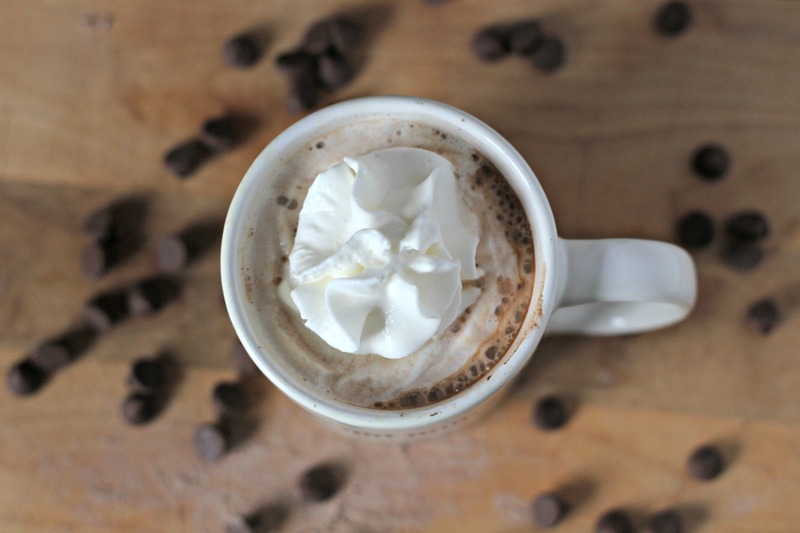 What is your favorite way to enjoy hot chocolate? Mixed in milk or water? Anything added in? Tell me your favorite flavors in the comments below. Previous Post: « Are you a Pantser or a Planner? how much mix for 1 mug of drink? Hi Gail, sorry for the delayed response! You can use either milk or water. Water will result in a much darker flavor. We prefer warmed milk. Is this okay to stay on my shelf? Or does it need to be refrigerated? It’s shelf stable. The powdered milk is a pantry item and doesn’t need to be refrigerated. 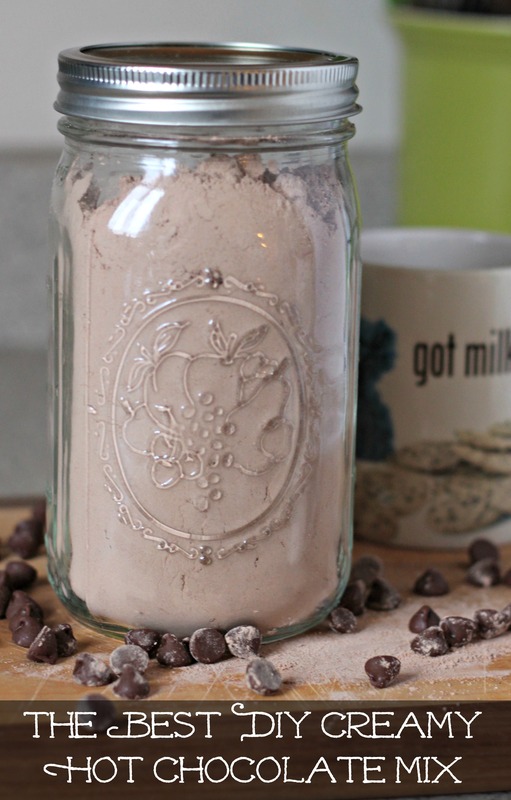 One of the most simple and charming gifts to give to guests are mason jars filled with hot chocolate recipes! It’s so useful and adorable to serve. 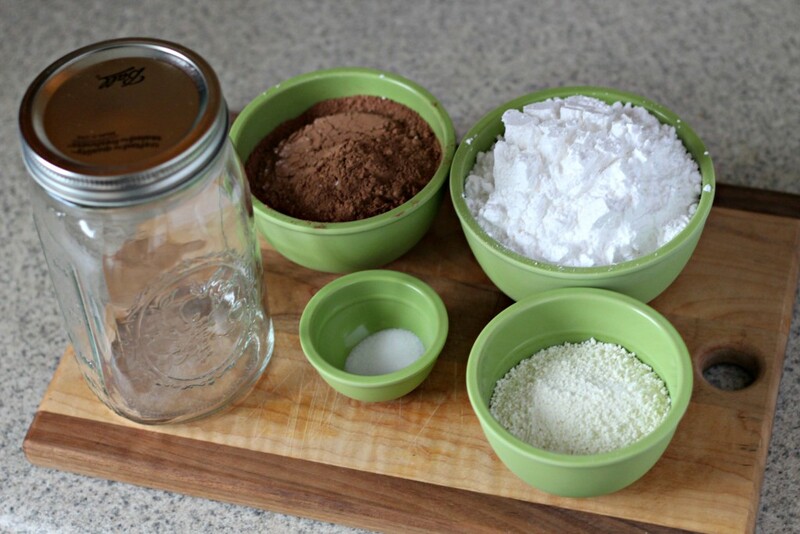 Thank you for sharing this hot chocolate mix recipe, now I can make more goodies for my guests! Thank you for stopping by! I’m actually sitting here drinking a cup with whipped cream and chocolate syrup on top (might be a fun combo gift basket). I was planning to give some of these away as gifts this holiday season too. I hope you and your friends/family enjoy this mix as much as we do! Do you really only need 1/2 cup of powered milk? How many servings does this make? We only use a 1/2 cup of powdered milk when we make this recipe. It is extremely chocolatey. If you want to add more go for it. I always suggest trying a recipe as written then making adjustments to make it your own. As far as the servings, it’s hard to say because everyone likes a different amount of mix in their drink. 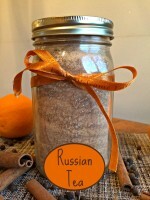 We can fill up a quart mason jar with one batch of this mix. Sorry that’s not an exact answer, but I hope it helps you narrow it down some. Thanks for stopping by! Hi Mary, I omitted dry milk since we make our hot cocoa with wet milk 😁anyways ended up adding brown sugar to my three tablespoons of cocoa mix per cup bc it was bland!! Well chocolate err cocoa flavored to say the least. So would you think this is bc my powdered sugar was too little sugar to much cornstarch? Seems to taste fine plain (and as made into frosting):) would hope to get this figured out b4 Christmas! Thanks in advance! This is a good question! I will say, this cocoa mix is a cocoa heavy recipe, so without tasting it it’s hard for me to diagnose the problem, lol. Here are my ideas. I use store bought powdered sugar, and it does have cornstarch in it. Not sure how much cornstarch though. If you make your own powdered sugar, it could possibly be a ratio issue so you may want to play around with it. Another option is to use granulated sugar instead of powdered sugar in the recipe and see how that works (though I love your idea for adding brown sugar!). While this isn’t an exceptionally thick hot chocolate like Champurrado, it is a little thicker than a hot water store bought mixed hot chocolate (if that helps you visualize it). I’m not sure if it’s the small amount of cornstarch from the powdered sugar or the dry milk that gives it that consistency (which again, is only a slight consistency difference, that I only notice because I’m thinking about it, lol). With that said, are you using whole milk or skim milk, or something in the middle? There is a difference in flavor between whole and skim, so that might be the problem. Another thing to try would be to use sweetened condensed milk instead of regular milk, then add some water to get it to the right consistency for your hot chocolate. That might give it the extra sweetness you’re looking for. I hope these ideas help! Let me know how it goes, I’m happy to brainstorm more with you so you can have the perfect cup of hot chocolate with the family for Christmas! Thanks for sharing your recipe. It’s Halloween night and I just told my daughter we should make homemade hot cocoa. I hope you love it as much as we do! Happy Halloween! Can I can this in an oven or pressure cooker? If so, at what temp. and for how long, Or, at what psi and how many minutes? Hi Heather, everything in this recipe is a dried product that is shelf stable so no cooking is required. You can place it in a jar and it will be good for several months. No canning or pressure cooking required! This looks great! What kind of cocoa do you use? I have Dutch processed cocoa; do you think that would work? I use Hershey’s brand (so Dutch processed) normally, just because it’s what they have at the store, lol. I have used a natural cacao powder once in the past and it was fantastic. Since this isn’t a baked product with leaveners swapping them out won’t change anything in the recipe except the flavor. At that point it’s just preference for one to the other so give it a try and see what you think. I used hersery’s powder and it tastes bitter. Any suggestions? I doubled the recipe and didn’t add chocolate chips. Just mixed powders followed the recipe other than chips and blending. My suggestion would be to either add in more sugar or decrease the cocoa powder. Different brands of cocoa powder may also affect the flavor. I do admit this is a deeper, richer cocoa than some. If I think of anything else I’ll let you know! I found this just in time to give out for Christmas and I’m so happy!!! For I’ve been searching so hard and with that said…couple of questions,things I probably missed. When ou make a cup,do you use milk or water? I know i prefer milk? And now I’ve forgotten the other the 2nd question…lol. But THANK YOU SO MUCH…My Mother will Love this!!!! You can use either! 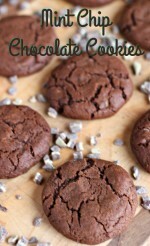 We make ours with hot water and it has a rich chocolate flavor. With warm/hot milk it will make it creamier in texture. There is dry milk in the mix, and if you find it’s too chocolaty or not creamy enough, try increasing the dry milk by 1/2 cup per complete mix until you find the consistency your family enjoys. Hope this helps! That’s awesome! I hope everyone loves this mix. 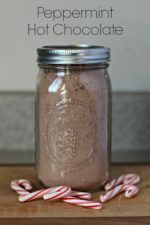 It’s also fun to add in different flavors, such as crushed candy canes or other flavors. Have fun with it! Merry Christmas to you too! How long is the shelf life ? I honestly don’t know. It doesn’t last us long enough to need to worry about it around here! I would look at the shelf life of the dry ingredients you’re adding and that should give you a general idea of how long it will last if you want to store it for longer than a couple of months. I’ve never tried it in cold milk so if you give it a try please let me know. I’m not sure if the heat helps to dissolve some parts of the mix, such as the cocoa, but it’s always worth a try. Maybe try it on a small glass of milk first in case it doesn’t work. Fantastic recipe. I’m a chocoholic and this just hits the spot. I can add as much or as little cocoa mix as I want. Also with milk or water or the combos of both. So versatile. Thanks for a great recipe. Instead of using cocoa powder use nestlie hot cocoa mix just to make it sweeter and creamier. Just a thought.